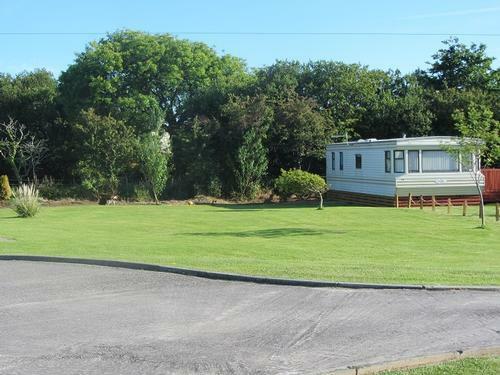 Our static caravan is on the west side of Anglesey, at the end of a quiet village Llanfachraeth, a short walk from the local tavern and village shop. 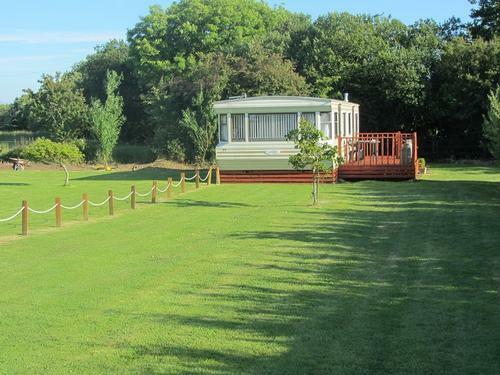 The caravan is sited in a large private garden. The accommodation consists of one double bedroom and one twin room, and a double air bed is also available. All bedding is provided, so just bring your own towels. 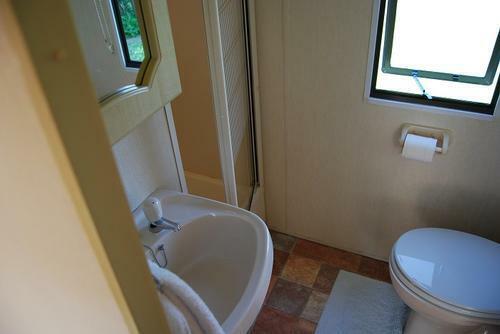 The caravan is fully equipped with all mod cons including tv with freeview, dvd and video player. 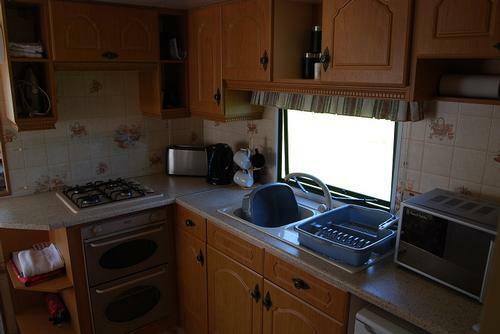 The fully equipped kitchen will meet all your needs. Large decked area with table, chairs and parasol, an ideal area to sunbathe and unwind with a drink or dine al fresco. 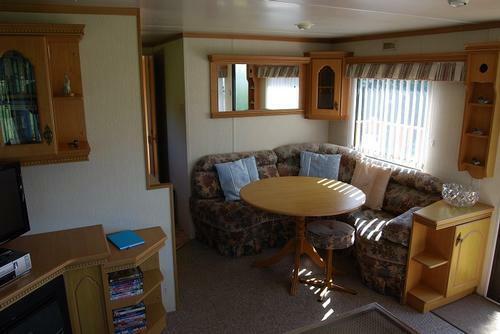 Lounge/dining: A comfortable lounge diner with dining table ample seating (12 feet wide) with tv, freeview, dvd and video. A selection of films games and books at your disposal gas fire and ample storage. Kitchen: A fully fitted kitchen equipped to high standard, gas hob and oven fridge, microwave, all cutlery and crockery, toaster and kettle. 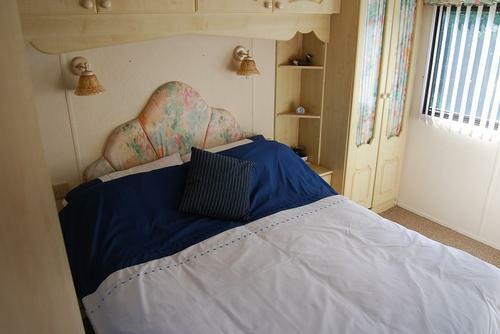 Master Bedroom: A double room light and fresh bags of storage clock radio and ability to use shower room en-suite. Twin Room: twin beds lots of storage. Family Shower Room: A modern, clean shower room with wc and wash basin. We are just 4 miles from Holyhead, the main ferry port for Ireland from where you can reach the Emerald Isle in just 99 minutes. A 25 minute journey takes you to the the Snowdonia national park where you can take a train ride up Snowdon, or a walk for the more ambitious. All in all a we offer you the opportunity to have a peaceful short break or a fun-packed family holiday. Holyhead is the local town and is the main ferry port to Dublin day trips are available with Stena Line and Irish Ferries. There are two large supermarkets for all your shopping needs, a village shop has most items - papers, off licence etc - opens 6am to 9pm and a 24 hour Spar shop in Valley village. There are lots of attractions in North Wales - something to suit everybody including fresh water and sea fishing, Blue Flag award-winning beaches, Caernarfon and Beaumaris castles, South Stack lighthouse, the Snowdonia National Park, Anglesey Sea Zoo, Holyhead Breakwater Park, Penrhos nature Reserve, coastal walks, five golf courses, a karting track and a motorsport track (Ty Creos), some top class restaurants, and RAF Valley - view the Hawk aircraft flying. There are brochures in the caravan for these attractions. 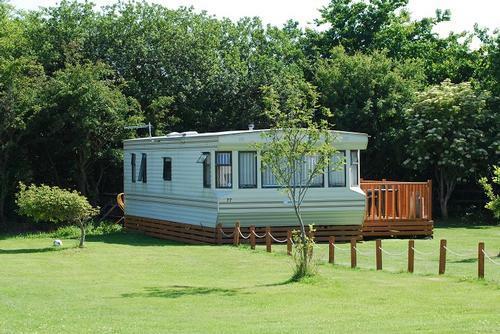 My husband myself and two children have had a lovely time here, the caravan was lovely clean and tidy and extreamly well equiped , we have never stayed in a caravan as a family before, throughly enjoyed it definetly recomend it. Ant and kate from Manchester. 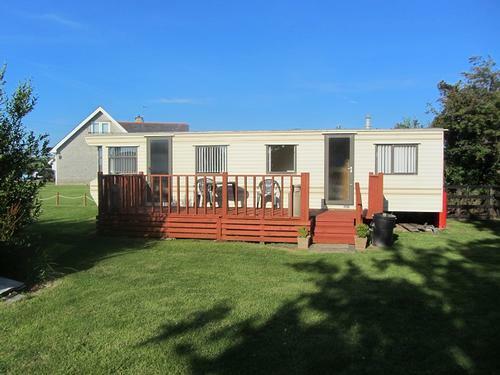 Booked the caravan last minute,can honestly say dont regret it for one minuite, caravan is excelent, Gareth and family made us feel at home, really friendly and accomodating, would recomend to all our friend, hope to be back soon. Louise, Bill and Matt Manchester. 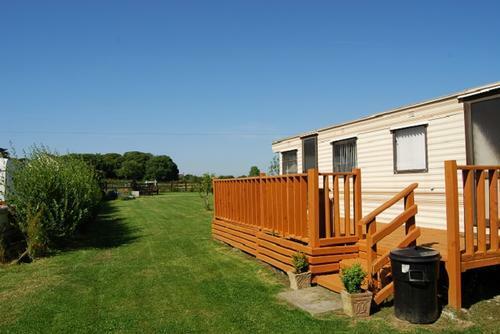 Friendly greeting by owner on arrival, caravan very clean and welcoming, all crockery and cutlery spotless, shower room spotlessbedding bedroom imaculate and comfortable, would recomend accomodation. John and Val, Wirral. 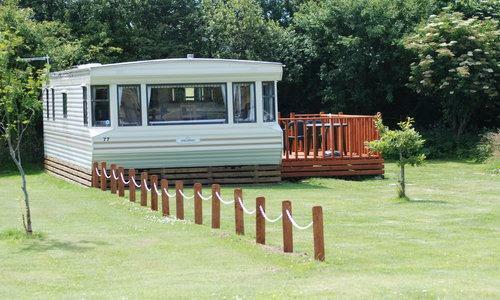 We have had a wonderful week clean and comfortable caravan with everything we need , our girls have enjoyed playing on the lawn, weather has been great, we could easily fill another week with all the things to do and see localy will be back next year. Ged, Georga, Nimah and Stephanie, Northampton. 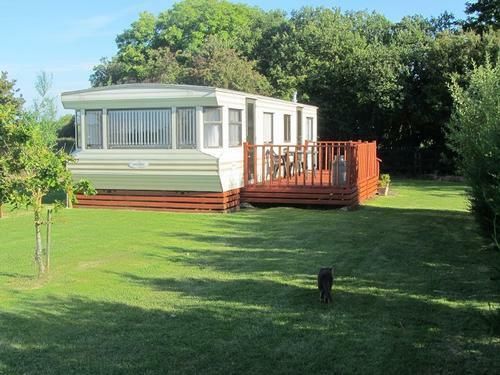 An immaculate caravan, clean comfortable and well equipped, great value for money, had fab long weekend for my hubbys 50th. Would highly recommend. Denise and Paul, Manchester. All bedding is provided crisp and clean. You will need to bring your own towels. 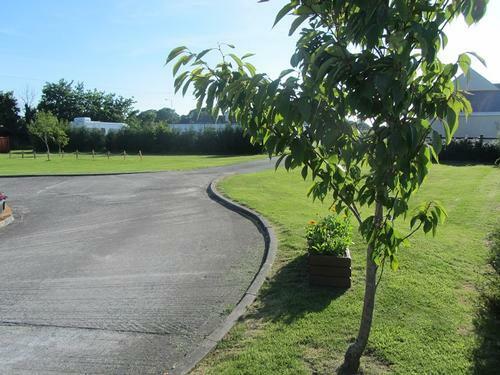 Gas water and electric are include in price, ample parking for two or three cars. No smoking in the caravan please, an ash tray is available for smoking outside. Sorry no pets. 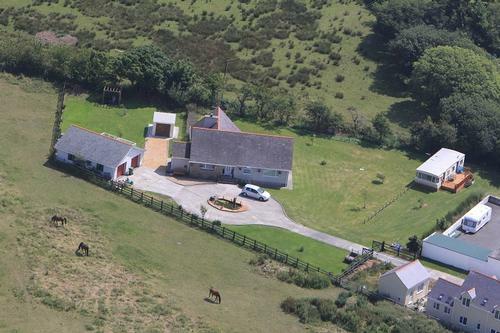 short stays available, minimum 1 week stay in the months of July and August. A non refundable booking fee of £60 is payable, and balance due on arrival please. Arrival from 3pm onwards and checkout by .